It's such a pretty fall day today. The air has taken a cooler turn. The colors seem more intense maybe because the sky is so blue. Where has the time gone this year? Is November really upon us? My mind can't wrap itself around Thanksgiving and Christmas just yet. A few of the flowers, like this toad lily, are hanging on. The rest of the garden is fading back into the earth. Preparing to rest up for the spring. As I'm contemplating the change of seasons and life today, I'm wondering if you are too. So tell me, what's occupying your thoughts today? You know, it feels like this year has just flown by. What happened to September?? Anyway, I really am looking forward to the holidays and spending time with family and friends. It's going to be warm, sunny nd a bit windy here. We are heading into summer but it doesn't really feel like it yet. Like you, I can't believe that Christmas is just around the corner. We don't have Thanksgiving; Christmas just kinda sneaks up on us right at the end of the year! This weekend I am going to play with my new-to-me quilting frame! I can't believe the Holidays are here! I just keep thinking of everything I should be doing to prepare, but I can't because I am so far behind. 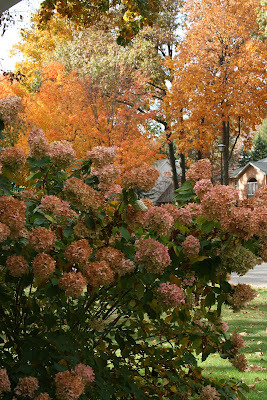 It is such a wonderful time of year! Colors, smells, even the menu of foods is such a delight! I am looking forward to spending time with family. 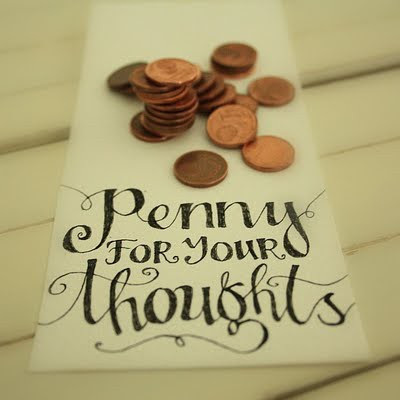 If you don't mind me asking... where might one get the stamp you used on the tag... "penny for your thoughts"